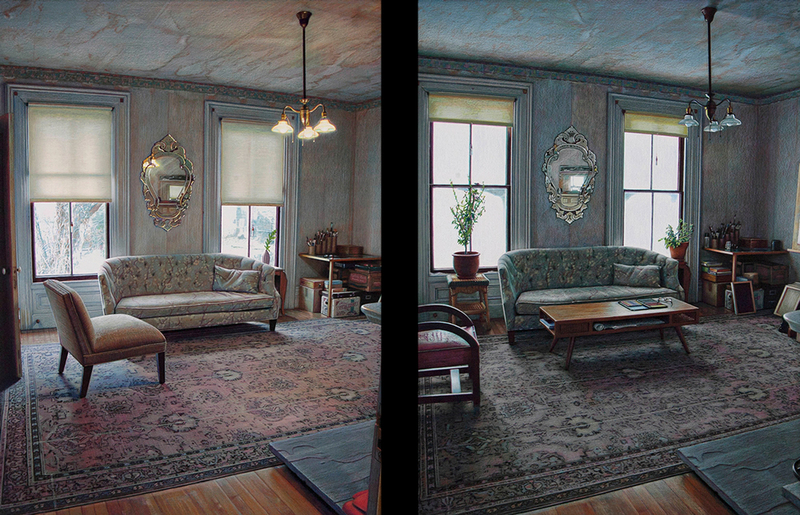 Eric Green is a painter living and working in Belfast, Maine. Eric went to RISD on a full scholarship at the age of sixteen. After attending the school for a week, he left to ride freights across the country, spending four years on the road. In addition to painting for thirty years, he has worked in a frame shop, assembled pulp testers, traveled with a carnival, restored houses, painted industrial buildings from a hanging scaffold, designed two labels for Brazilian beers, written four novels and a column for the local paper. He has had two solo exhibitions in SoHo and Chelsea, received three grants, and a merit award from the National Academy of Design. I own several pieces of Eric's work, I treasure them all, and they are gorgeous exquisite beautiful drawings. Drawings to get lost within. I would love to own something he has done with color, and if I had the circumstance, I would own one of these pieces. I have seen several in detail, and I cannot fathom the quantity of work and time and dedication and sheer raw skill it must have taken to create one, let alone them all, each more stunning than the one before. The 'detail' was via photograph. What I wouldn't give to see one in person. But alas, that won't be possible. Distance, and time. I'm 65, and while I hope I'm not too close to my passing, it is there on the horizon. Afraid? No. My life is better than it has ever been. But I pay more attention to that which is important, and less to the meaningless, and the passage of time I notice, and it is a sweet clean creek upon which I drift gladly and with gratitude. So thanks, Eric, for allowing me to join you as you journey through your own time. These beautiful works deftly echo this moment in my life, and I am grateful beyond words for your generosity, and the enormity of your Gift. time, season, light, day, night - all pass, change, imperceptibly. we look and see. thank you, eric green, for this moment, like a music, "when it is gone in the air, you can never capture it again". 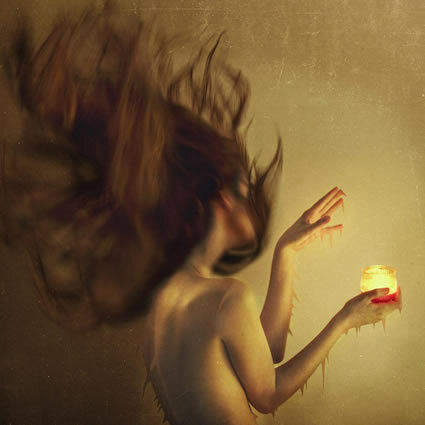 you've let us enter in this interstice, catch a glimpse of eternity, between, before, after, here and always. 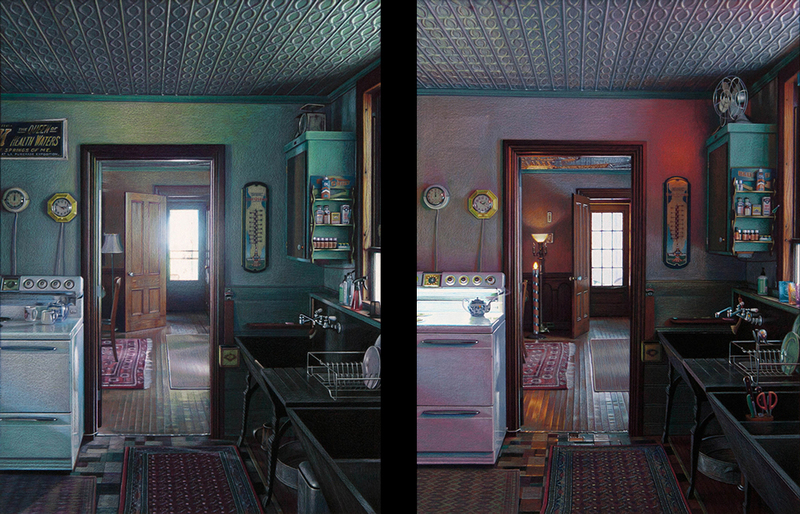 Eric Green's detail to subject, space, color, light is amazing, getting more intense over the years. I have been lucky to have grown up with a fathers various mediums, a true artist. I alone have so meney art works, I have no more room on my walls. So all my life I have compared other artist to him ,and I have been to meny museums here and abroad, I cant help myself. I'm 62 . If I could I start over and collect art, Eric Green work paintings and pencil would adorn my walls.My sugggestion to anyone that you should look at art in its real form, computers don't do justice, and owning art gives you time to discover the phyical depth, and emotion, that emits from them . Thank you Mr. Green. Great work, Eric - I'll be in Belfast soon, & hope to see more. Absolutely brilliant, Eric - you're a man of many talents! I am always astonished when I look at Eric's work. He does everything with utmost care and his great talents are well refected in his masterpieces.